Most heat is lost through the sides and bottom of a pool. Use the same materials as your custom home and enjoy real savings all year. Insulating Concrete Forms are one of the most versatile building products on the market. They are frequently used for many structures including homes and commercial buildings and are growing in popularity for building swimming pools. BuildBlock customers have constructed retaining walls, fences and gates, fire pits and more. One increasing request for information has been ICF swimming pools. ICFs in swimming pools not only speed construction, but the insulating foam prevents more than 80% of the heat loss of the pool. This means it’s much cheaper to heat your pool, but also increases the length of the pool season. BuildCrete Pool Plaster, a Gigacrete product is perfectly suited as the waterproof coating and plaster directly applied to the EPS foam. Another full line of ICF pool construction products can be found at sider-crete.com ICF pools are being built on many types of projects. Usually found in large custom homes, they are also found in community pools and as an energy efficient addition to existing homes as well. ICFs primary component is EPS foam. They are easily formed into almost any shape imaginable and since they form an extremely flat and smooth wall, they are easily finished. Contact Pool and Spa Designs today with your pool design questions. 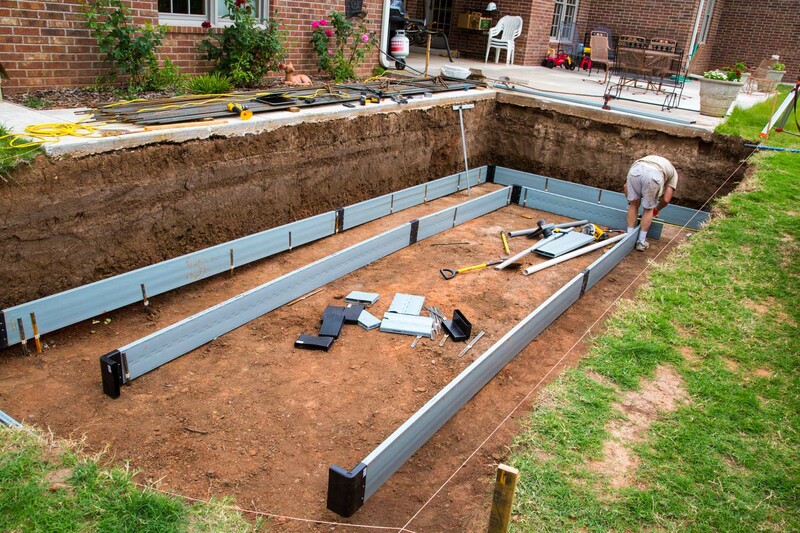 Looking to build your own ICF pool? Pool and Spa Designs is BuildBlock’s preferred design partner offering both residential and commercial drafting services for ICF pools. Pool construction plans are drawn to scale using national building standards. Residential plans are drawn on a 1/8” scale and formatted on 11” x 17” paper. A full set of construction plans comes with a general construction layout, customized cross sections, and plumbing isometrics. A comprehensive equipment list is also spec’d to fit the nature of your design. Upon completion BuildBlock will assist with formatting the block layout for your pool. Download these sample plans for an example of their work. If you’re a pool contractor looking to build with ICFs, let us know. We will set you up with the resources you need to build with BuildBlock! Easily Shaped, Modified and Stacked. Most residential swimming pools are built in conjunction with custom homes and frequently when the owners choose to build with ICFs for longevity and reduced energy costs, they’ll choose an ICF pool for the same reason. This great simplifies construction and uses the same materials as their home. While BuildRadius is the fastest and easiest way to create curved walls for your pool, it is important to remember that field fabricated radii are also possible with all BuildBlock and BuildLock standard straight forms. View this CAD detail for specific information on how to create radius walls from straight forms or the BuildBlock Installation & Technical Manual. Free BuildBlock ICF Swimming Pool Engineering Now Available! The BuildBlock ICF Swimming Pool Engineering Manual is intended to provide prescriptive requirements for the design of BuildBlock Building Systems ICF In-Ground and Above Ground reinforced concrete Swimming Pools. It provides the wall, footing, and reinforcement designs for building above ground and in-ground ICF pools, cisterns, and water basins. This guide provides recommended designs for a variety of soil and seismic conditions. 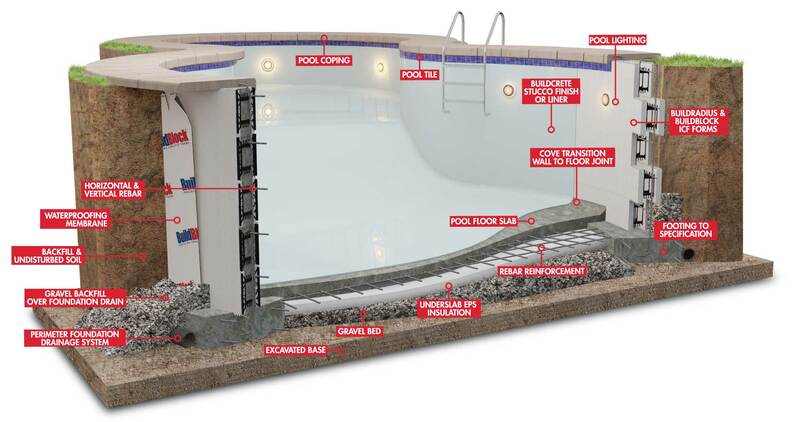 Download this guide now and build the most cost effective energy efficient pool possible. 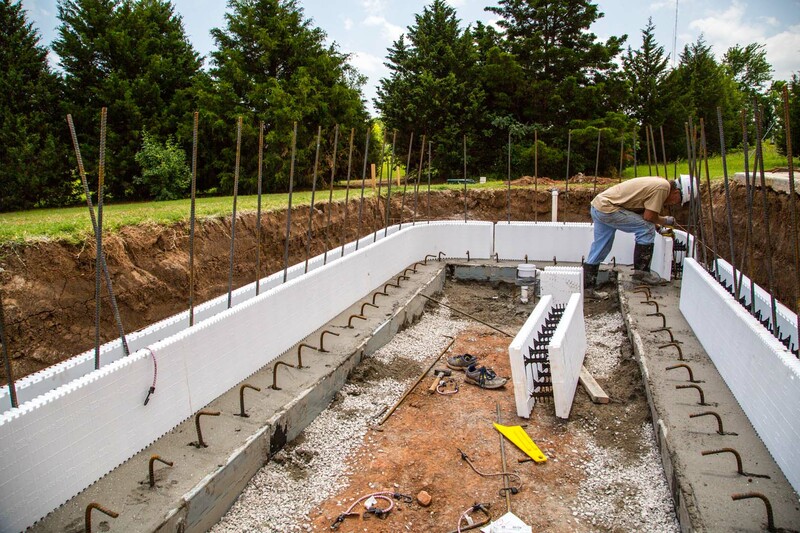 Building an ICF Pool is now even easier with BuildRadius ICF forms. Combine BuildRadius with BuildBlock forms to create any shape or style imaginable. 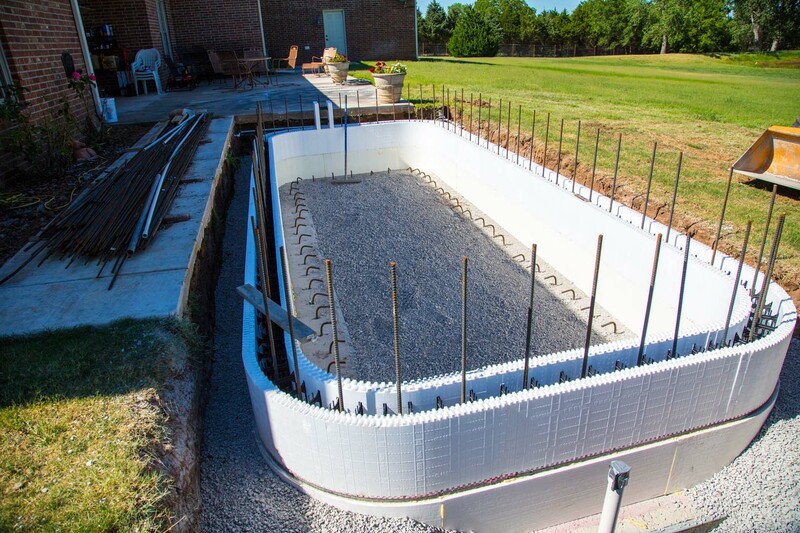 BuildRadius is a family of radius forms for use in ICF walls and pool construction. The BuildRadius forms create 2’, 4’, 8’, 12’, 16’, and 20’ arcs. Each of these blocks interlocks into any BuildBlock 6” product line and uses the standard BuildBlock webs. Available in 6” widths initially, these forms are designed to ease construction of energy-efficient ICF pools, southwest style homes, bay windows, circular staircases, and provide options when designing unique areas in ICF homes. BuildBlock recommends finishing directly on the ICF with BuildCrete Pool Plaster, a GigaCrete product, at least 3/8” thick with an embedded fiberglass mesh. The advantage of the BuildCrete Pool Plaster process is that it’s a one-coat finishing process. The pool plaster product can be finished completely smooth and is 100% waterproof. Form-A-Drain or similar system is installed along with a waterproofing membrane to the outside of the ICF and gravel is backfilled to the waterproofing. The drainage system needs to either drain to daylight, a sump, or other location to keep the two water tables separate. We are currently in the process of building a BuildBlock ICF pool in Oklahoma City. This project utilizes BuildBlock 6″ straight forms, 2′ curved radius forms, and the Form-a-Drain footing and drainage system. This gallery will be updated as progress continues. Click here to see a brief overview of ICF pool construction. Placing chalk lines to mark the outside area of the hole to be dug. Laser level is used to set benchmarks and level the site before digging. Digging the hole for the pool. Form-a-Drain footer and drain system is going in. Footer and drain system is installed. Gravel, steel, and plumbing is installed in footer. Footer before concrete is poured. Placing the first course of forms on the footer. The first course is waterproofed and protected. Second course is stacked. Vertical rebar extends from the footer into the walls.